The problem solves by itself as sometimes circumstances change. Somebody else will decide and act. Pray that the decision fails miserably and your approach of 4D’s is vindicated. One becomes comfortably numb with the problem and learns to live with it. Over a period of time one doesn’t even see the situation as a problem. 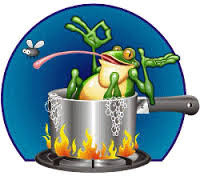 Frog in the boiling water syndrome. The problem may become an opportunity as circumstances change. In China the word for crisis consists of two characters opportunity and danger.